Colette successfully creates an illuminating look at the mores of the past and the struggle for an equal chance in life. If there is one commonality to much of the filmography of Keira Knightley, it must surely be period dramas; from Atonement to Anna Karenina to The Imitation Game, her performances in these historically minded films has thus far been a wonderful cinematic journey. And so she continues most wonderfully in director Wash Westmoreland’s Colette, a movie that functions not solely as a biographical sketch but as a commentary on gender roles, society and female empowerment. Through handsome set and costume design, an effectively good musical score, and of course strong lead performances, Colette is delightful at being both entertaining and insightful. Looking into early 20th century morals that continue to have relevance in our modern day, this is an incisive and intelligent work. Based on the early life and marriage of celebrated French novelist Sidonie-Gabrielle Colette (1873-1954), the movie charmingly shines a spotlight on the formative years of this great writer while simultaneously providing a refreshingly smart outlook on morality and societal values. Growing up in rural France, the young Colette literally encounters a cultural shock when she moves to Paris with her new husband Henry Gauthier-Villars, better known as Willy. Aristocratic and libertine, Willy literally takes the peasant girl out of the country right into the glamour and viciousness of upper-class Parisian life. It is here however that despite the sense of being an outsider, that Colette begins her literary career under the most unique of circumstances. As ghostwriter for Willy’s famed series of coming of age novels “Claudine”, Colette is confined between the pressures of her husband and the judgement of people unwilling to accept a female novelist; but while she lets her husband take all the credit and glory, soon the urge to rebel surfaces in this most unconventional marriage. Keira Knightley delivers exceptionally as the titular heroine being at once vulnerable and innocent, as well as headstrong and utterly brilliant. She portrays Colette’s literary genius capably and is commanding and sensitive. The audience follows her journey into this world of high culture like her reluctantly and then confidently. Colette seems to be the embodiment of the ‘every-person’, thrust into a strange environment only to discover the talents that lie within. In a splendid supporting role is Dominic West as Willy, who too is most commanding, charming and ultimately despicable. A man of letters and sophistication Willy’s double existence as a womanizer and liar cause great strain on his marriage to Colette but also great inspiration, which provide some of the most entertaining and thought provoking sequences in the entire film. 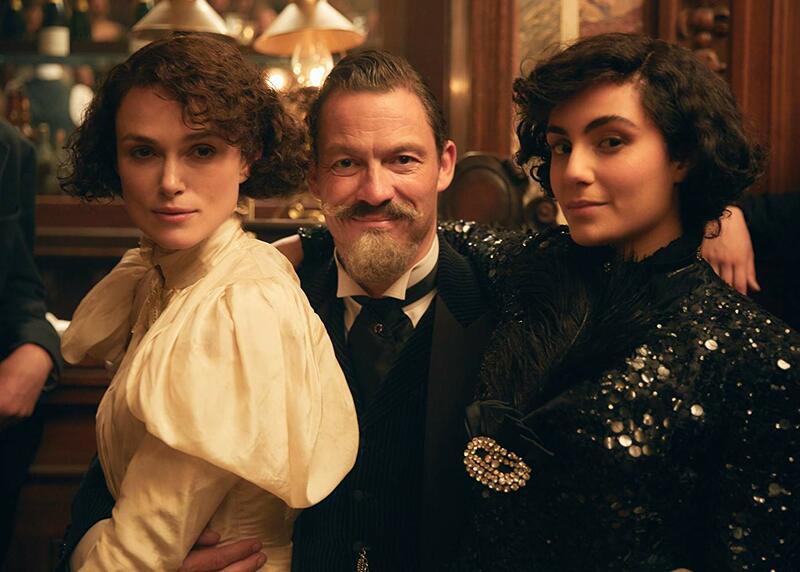 The chemistry between Knightley and West is natural and riveting and the extraordinary marital relationship between Colette and Willy is as fickle as one might imagine. At times deeply in love to then bickering over creative control of the “Claudine” books, from arguing over Willy’s infidelity to bonding over a shared love affair with an American socialite, the partnership between the two is tender and tragic. Director Wash Westmoreland has captured the dynamics of this explosive personal and professional relationship with a lens that allows us to question a number of moral quandaries. What exactly should the role of women be in a male dominated society? Should Willy be excused for his infidelities because he has “male urges”? Although the narrative occurs at the beginning of the 20th century, the themes of female emancipation seem especially poignant in today’s climate and Colette is certainly portrayed as one of the early examples of a strong independent woman, despite the constraints of her marriage and society. She puts up with the charade of hiding her written abilities for years until Willy’s transgressions finally cross the proverbial line, and Colette finally takes her place amongst the great writers. Featuring such other themes as homosexuality and trans-genderism placed in a far less accepting time period (it may be argued we still have not moved far enough in acceptance today), Colette is a very intelligent and impressionable film. Using the biographical life story of the titular novelist as a canvas it successfully creates an illuminating look at the mores of the past and the struggle for an equal chance in life. With the aid of rich set design and authentic period clothing, and a sweeping musical score by Thomas Ades, this movie recreates a period of our history with great respect but also with appropriate criticism. Its ability to not only inform but make us question makes it a film of high artistic value. The literary output of Colette may not be overly known to North American readers, yet her story of perseverance and struggle should find admirers in any corner of the globe. With great performances to anchor it and an astute look at moral and social issues, the film nobly attempts to answer and question timeless themes in an emotional and sensitive fashion.